5:45 AM on August 18th marked the beginning of my long anticipated ride from Oklahoma City to Wichita, Kansas and also the midpoint of the Breakthrough Ride. I had the wonderful opportunity to attend the signing event in Oklahoma City the previous day, where I was further inspired for my ride by the volunteers and the many people willing to sign the petition and recognize the importance of Alzheimer’s disease at a national level. Here I also met my riding partner, Tom Kukars, and we were passed the baton brain that would ride on my handlebars for the next 2 days. After our briefing and a wonderful breakfast with the support crew, who were to be our heroes for the next two days, we headed out to the starting point. The ride along Oklahoma’s sunny back highways was beautiful; we wound around rivers and through the hills. Throughout the day we passed fields of red tilled earth, grassy rolling hills, and cattle, who often seemed very concerned by our presence and occasionally would run away as fast as they could to hide in the trees. This was my first trip to Oklahoma and I admit I was surprised by the number of hills, some quite steep, that Tom and I climbed on our way to the Kansas border. With the rolling hills and the heat, which topped out at 108 degrees, our support crew became our saving grace. As each rest stop drew near we could see the pony waiting and Evan always with a smile, encouragement, cold water, and towels. When we needed to cool down between scheduled stops, Melanie in our lead car would scope out some shade, and she and Glen, our caboose, made sure our water and Gatorade was full and as cold as possible. We were very spoiled to have such wonderful support throughout the ride, both in planning and execution, who also made it impossible not to have a great time. During the final leg of our journey into Tonkawa the hills receded and we were lucky to have a little tailwind at times. I could feel my body tiring, but knew I would not stop. The millions of people suffering from and caring for people with AD can never stop, so neither would I. We completed our day in Tonkawa and had a lovely dinner at a local home-style diner near our comfy hotel in Blackwell. It was here that Tom and I received our official nicknames from the pony support staff: pickles and puddin’. Previously in the day I was dubbed Ripley, and if the bugs I fought off riding that afternoon were aliens the name might have stuck, however it was pickles that I would answer to for the rest of the ride. That evening when I recalled the events from the day, I felt that I had accomplished something much more than this single day on my bike or a day in the laboratory. 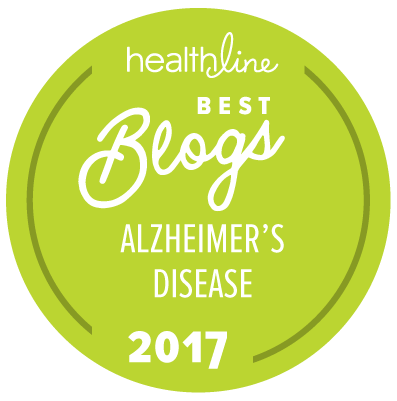 I am honored to be part of the Breakthrough Ride, an event that can actually change the way this nation addresses Alzheimer’s disease. I was unable to help my grandmother and grandfather as Alzheimer’s disease slowly took them from my family, but on this day I felt that together with all the riders, researchers, volunteers, and people signing our petition, I was helping to defeat this disease. I dedicate this day, the longest day of my ride, to my family, those we lost and those who worked tirelessly as caretakers for so many years. 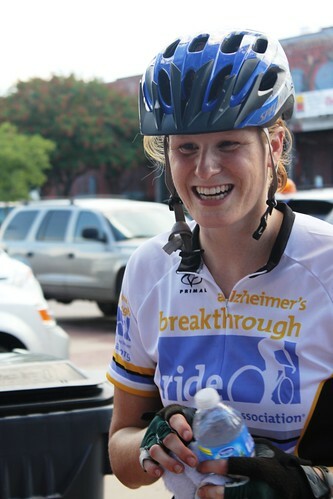 -Jerrah Holth is a molecular and human genetics doctoral candidate at Baylor College of Medicine in Houston.Holth’s segment of the ride began on August 19 in Oklahoma City and ended on August 20 in Wichita, Kansas.